“Got a few minutes? Let’s go look for rocks,” Lewis Haskell remembered Fred Allen saying. The young North Haven Island native, later the venerable historian, remembered this invitation well even in his old age. They would walk along the shore and he would point to a stone and ask Lewis to look at it. Could he see anything in it? The boy had a story-teller’s imagination even then. There was gray granite brought by the glaciers, pink granite from Vinalhaven and North Haven greenstone found only on this island in Penobscot Bay. The stones were of all shapes and sizes, a treasure trove for the creative mind. 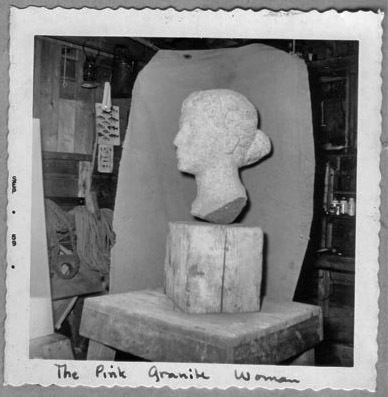 Head of a Woman is pink granite, probably the beautiful coarse pastel stone quarried from North Haven’s sister island, Vinalhaven. Of “heroic” size, it is the female partner to the Egyptian Head, Allen’s personal favorite work of art, carved from a North Haven gray granite beach boulder. 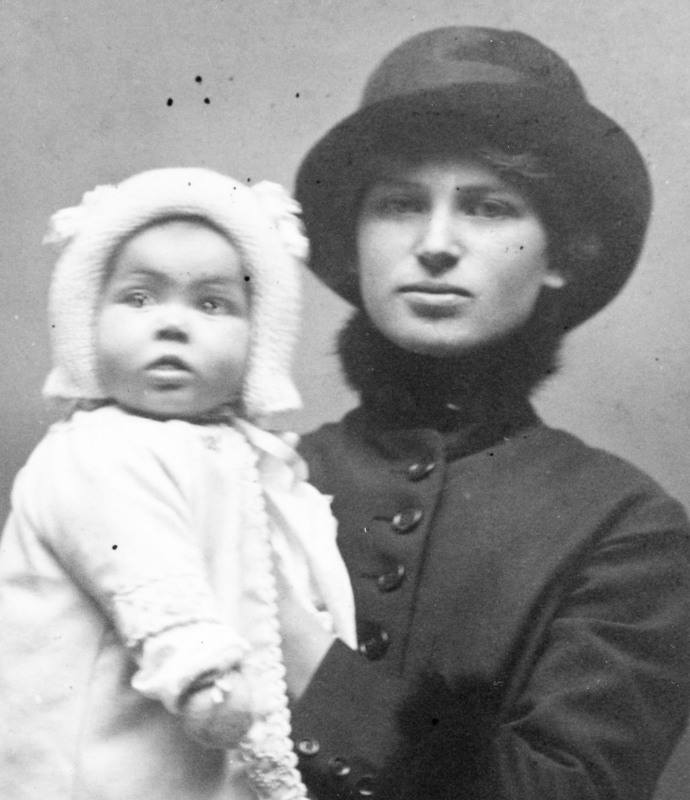 Head of a Woman was started in North Haven. He worked on it over the years both there and in his Tavern Road studio in Boston a block from the MFA. There, he was head of the sculpture department at the School of the Museum of Fine Arts and a part of the Boston School of artists where advanced students learned direct carving. Created in a similar style to its male partner, the female head is softer in all ways, yet as with Egyptian Head, seen from all sides and in a variety of lights, you might think you were looking at different pieces of sculpture. The hair on the right side is different from the left and the face takes on personalities depending on the viewing angle. The inspiration is probably his wife Agnes, his muse in her youth. The face is full and delicious in its sensual qualities, yet elegant and sophisticated in its presentation. As with the Egyptian Head, it is strongly and simply conceived. At the time he was sculpting these two heads, modern art was gaining momentum. William Zorach was doing simplified direct carvings, also on the coast of Maine. One of his pieces was purchased for the Goodstay Gardens across the pathway on the opposite side from Allen’s Head of a Woman. Upon closer inspection of this stone head, it becomes clear that Allen was a making a statement about the difference between classical and modern sculpture and was creating a bridge between them. The left side of the head is classical in styling with detailed tight curls, rows of braid and a fully formed year. The composition is of very detailed parallel rows with a clear line separating the rows of the bun where it is pinned to the back of the head. Tight curls continue behind the ear at the neckline. The right side is decidedly modern, simplified in the relative lack of detail; the hair is a carved texture only, no rows of braid, and covers most of the detail of the ear of which only the suggestion of an outline remains. Where it is pulled back into a bun, it is almost chopped away, leaving only the rough shape. Allen taught that in direct carving, all of the stone should be used. Upon viewing the center of the bun, there is a rust colored stain in the area around which the hair is wound and more of that undisturbed shell discoloration is evident under the side of the neck. The lack of a garment eliminates a clue to suggest a time in history and while one side of the head is classic, the other is modern and the mounting is thoroughly modern. It is timeless, a bridge joining the old and the new. 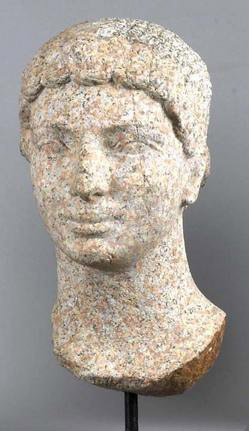 Head of a Woman was purchased by the Delaware Art Museum and now resides in a private collection.